We’d love your help. Let us know what’s wrong with this preview of Eight Spells a Week by Nell Scovell. Eight short stories take the reader through a magic-packed, disaster-filled week in Sabrina's life. When a witch breaks a mirror it means seven days of bad luck, starting now! Just when Sabrina thinks she can handle the bad luck, her Quizmaster has picked this week to test her magic powers by sending seven temptations her way. To ask other readers questions about Eight Spells a Week, please sign up. The kid in me really wants to love these Sabrina books, but they are truly not very good. It's possible I would have loved them when I was younger and nostalgia would cloud my view, like with Fear Street, but I'm just not sure. However, they are cute and mindless reads, and sometimes I just need that escape. I also found a bunch of them at Half Price Books awhile ago, so I'm determined to eventually read all the ones I bought. To be honest, I've never seen a single Sabrina the Teenage Witch episode although I'm sure I would've been a big fan. I really enjoy the books though. This wasn't one of the best, but it wasn't the worse. 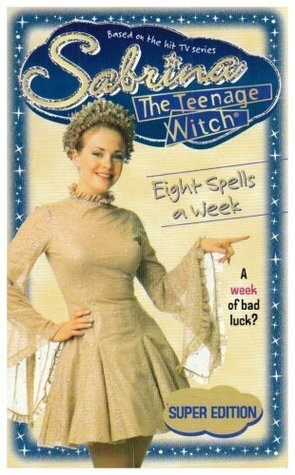 But Eight Spells a Week was definitely where Sabrina has the most troubles. I love the fact that she gave up her magic knowing that it's the right thing to do. And it is the right thing to do, she got to see her mom and earn a life lesson! Favorite Sabrina book!!!! It was really the best! Not only their is the inspector of magic but also plenty of spells and poor Sabrina has to face very difficult decisions. I used to love this T.V. show, along with the books.. now I don't care for both much anymore. Very nice and quick read.